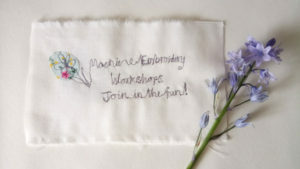 Freehand machine embroidery, freemotion embroidery or free machine embroidery... so what does it actually mean? 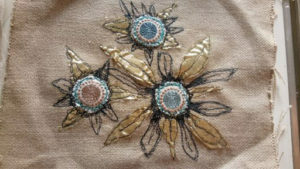 It comes under many guises but essentially it all means the same thing.... drawing with your sewing machine! 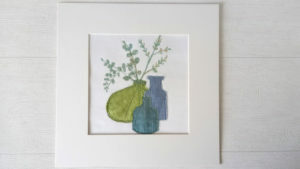 Being able to draw with your sewing machine allows you to express yourself, create wonderful pieces of art and embellish your work. 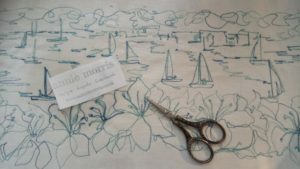 Once you've mastered the technique this opens up a wealth of of creative opportunity thus allowing you to use thread in your machine the same way an artist uses a brush and paint.... You can literally draw 'freehand' with your machine. To get started you simply need your feed dogs down or lowered and a darning or embroidery foot. 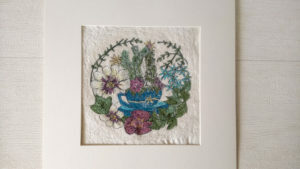 A darning or embroidery foot has a small round opening through which the needle passes whilst sewing and with the feed dog down, this allows the fabric to pass under the needle freely. From my own personal experiences I've found the freedom this technique allows to be extremely addictive. I've always been creative, my earliest memories are as a child sketching away in my room at any given moment. I went on to study textiles at university and worked for many years for various reputable fabric companies. I think this has had a heavy influence on my own work, which has consistently revolved around fabric...... Even my father was a tailor! 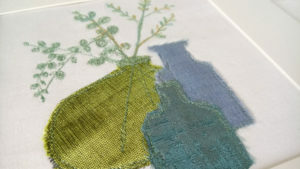 Through free machine embroidery I can freely draw lines, write words, create landscapes, bring sketches to life on fabric and it also allows me to have total control of the stitch direction. 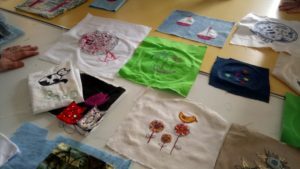 Starting out is fun and I would recommend being brave and just having a go!....Find some different threads, scraps of fabric and just have a play! Backing your chosen material with additional fabric such as felt will add weight and stability. You could also use a product such as a stabiliser. This is used to support the fabric during the stitching process and to keep it from puckering or stretching. Various options are available including water soluble, heat removal and tear away backing and can be found either online or at a good old fashioned haberdashery! 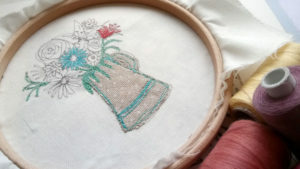 A wooden hand embroidery hoop (this is optional, but I strongly recommend for beginners for helping with stability and work that is going to be heavily stitched). 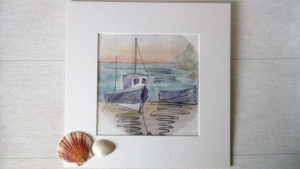 Stabilser (water soluble, tear away). Come and join us on a workshop! It's finally here! My online store is up and running at last! So far October has been wonderful, collecting fruit from the garden and working hard on getting the online boutique ready for you all to enjoy. This year has really flown!